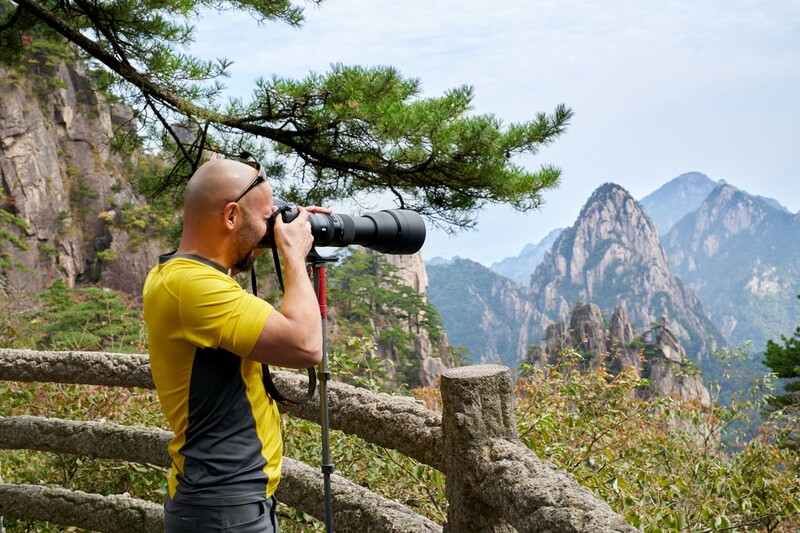 A plan to scan (a fog-less) Huangshan. I’ve said this many times before, but I’ll just have to say it again: China has just so many unique natural places of off-the-scale beauty. Mountains, multicolored rocks, brightly-colored lakes. So much beauty that a trip to China is fast becoming a yearly tradition for me. The internet tells me that these mountains were formed around 100 million years ago (that is, in the era of the dinosaurs). Later, glaciers and erosion created these fanciful design configurations, while today the place is a protected national park. 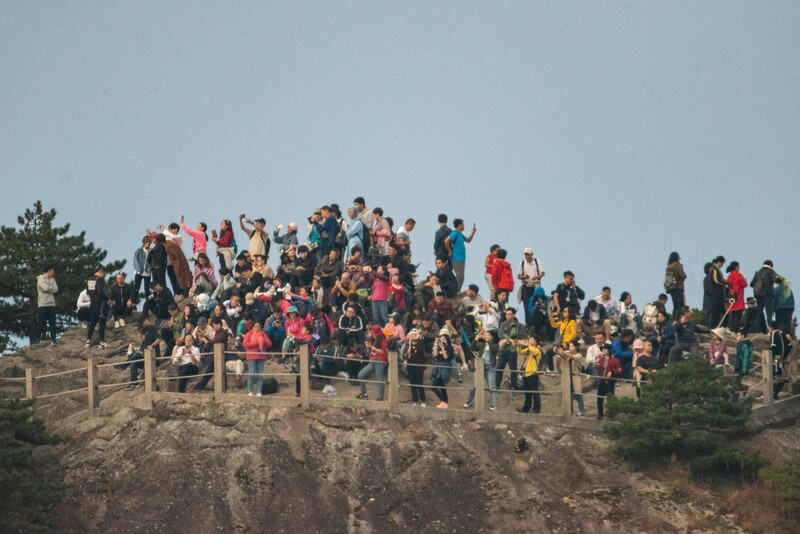 The internet also tells me that the place is one of the most popular tourist destinations in China. In 2007 apparently 1.5 million tourists visited the mountains! 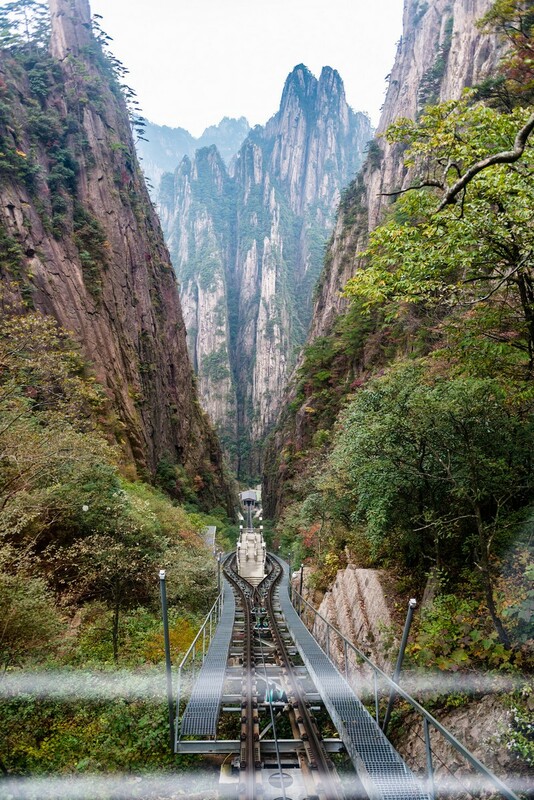 Well, looking at pics of the lines for the cable cars here – I can believe it. But that was 11 years ago. Today those numbers might have increased several-fold. Let’s say they only increased two-fold, that’d mean there’d be 10,000 visitors per day! And all of them wanting to take one of the three cable cars. 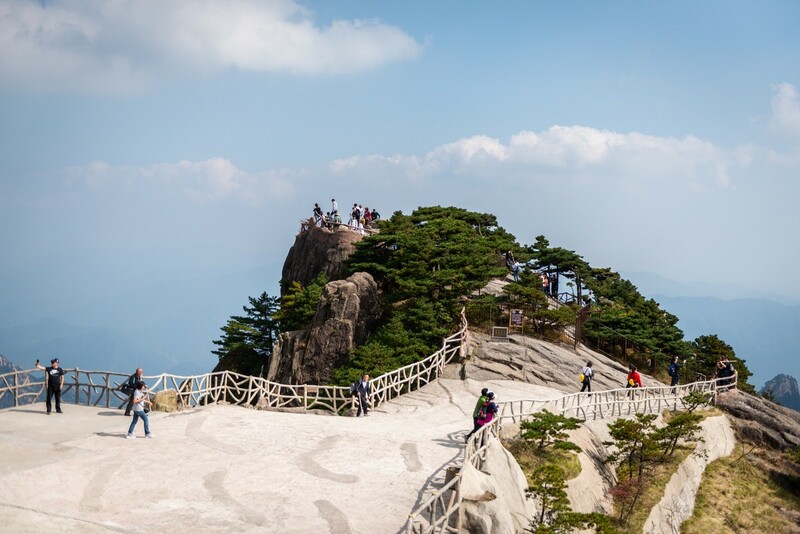 That translates into the line therefor lasting three or four hours – about the same length of time it takes you to get to the top (steadily) on foot! UPD: I was about right with my projection of the number of tourists today based on the number back in 2007. I found a Chinese site that puts the figure for 2017 at 3.36 million! 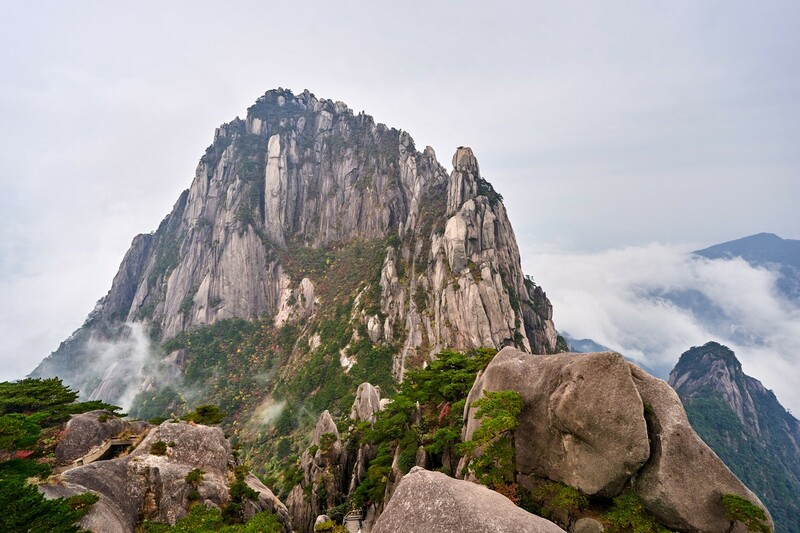 On we hop, and up the mountain we whizz! A quick separate note on how impressive the… touristic infrastructure is here. The paths and steps: top notch. Strong fencing and/or hand rails where needed: check. Neat looking trash cans, some cut into the rock – everywhere. Staff picking up litter: very common. Public conveniences: plentiful and pristine (less so, perhaps, during Golden Week). 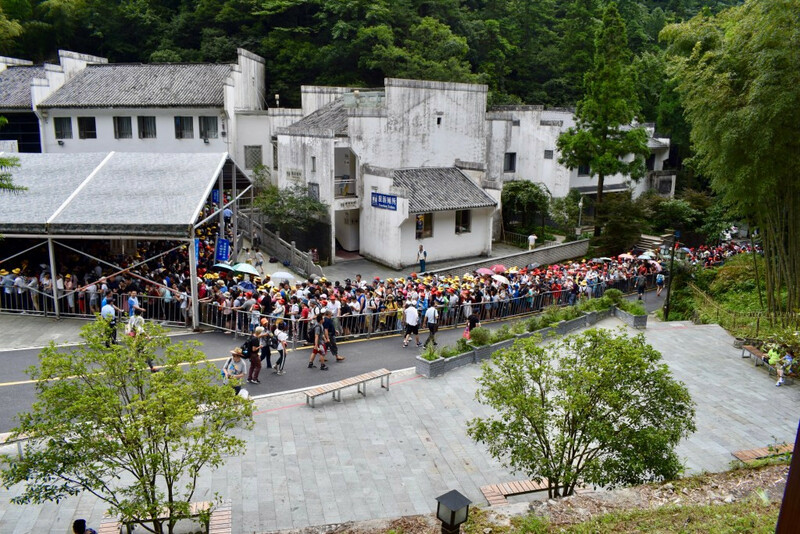 Every half an hour along a path: cafes and other Chinese fast-food outlets (yum!). So yes: the set-up here is real nice for the visiting tourist. But you need more than just a day to take it all in – and just one sunset wouldn’t be enough. The whole route takes two full days. You can stay the night at the top too in one of the decent hotels. The food isn’t haute cuisine, but the beds are comfy and the rooms clean. This year – in the white hotel over there. It’s called ‘Bai Yun’ (白云), or ‘White Yun’. I had to look up Yun – it means cloud. Of course! ‘White Cloud’! Btw, you can stay overnight cheaply here in a tent which you can rent from a hotel for a night for not much at all. So, what do you see?! 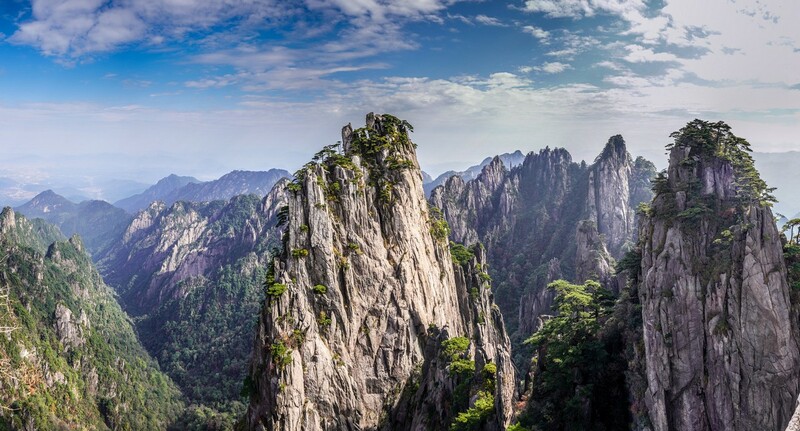 Just to remind: that was Xihai Canyon – on the map (further below) it’s in the top left corner. …But what’s that there up on top? But before we came to the steps we had to navigate this here scary path-on-stilts. Yikes! 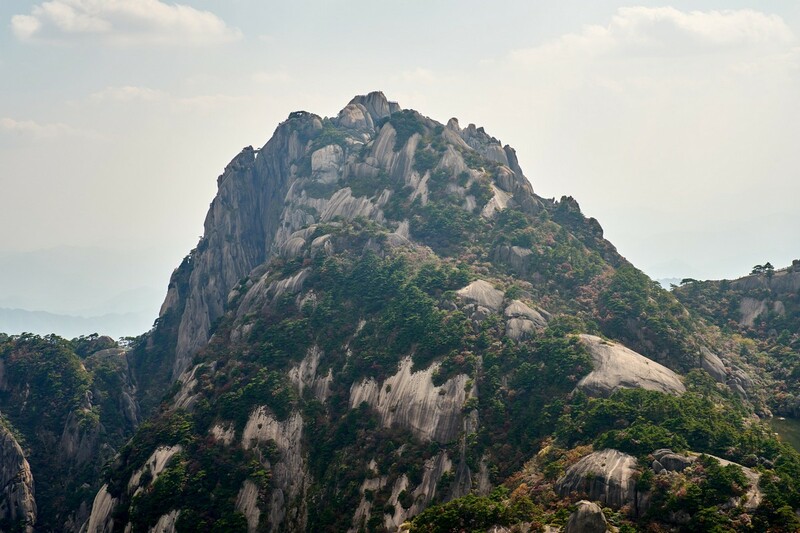 This is Lotus Peak, btw. Alas, it was closed for repairs. Getting back down to the very bottom – to the bus park takes an hour or two. 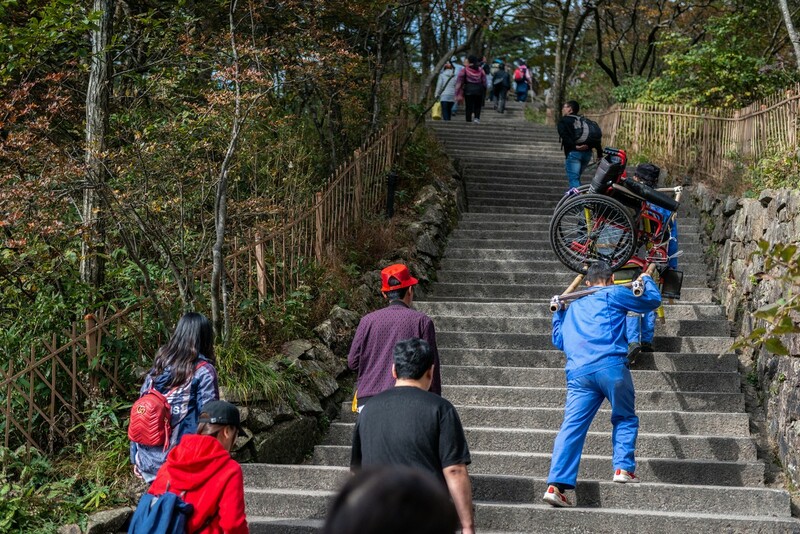 Who’d have thought going down steps could be so tough?! My travel companions finally made it back down, but their legs were almost dropping off with over-exertion; after all, this was our first spot of mountain scaling, and they’d hardly had a chance to warm up their muscles. 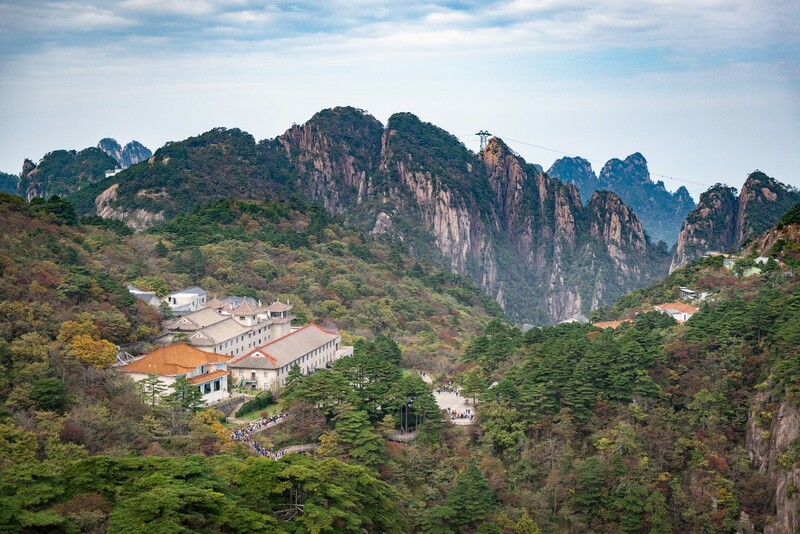 Take-away: before a mega-climb in Huangshan, have a quick session in the gym in the hotel or go for a run ). All righty. That’s about it. Just a few PS notes on logistics. 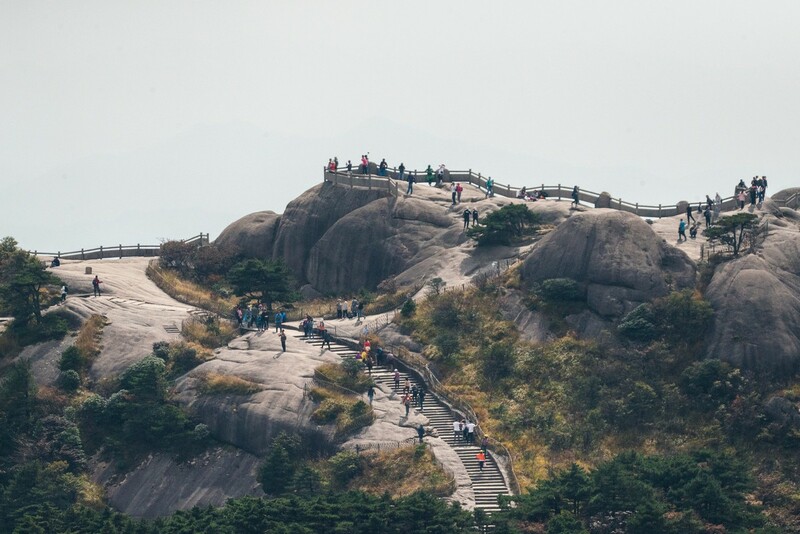 You can get to Huangshan in various ways. The main one – via the local airport, through which there are many flights. There’s also the train, apparently, or coach – which takes five or six hours from Shanghai. Ok; that’s it for logistics. Btw, it snows here in the winter – which adds a whole other aspect to the natural beauty. Check these pics out. 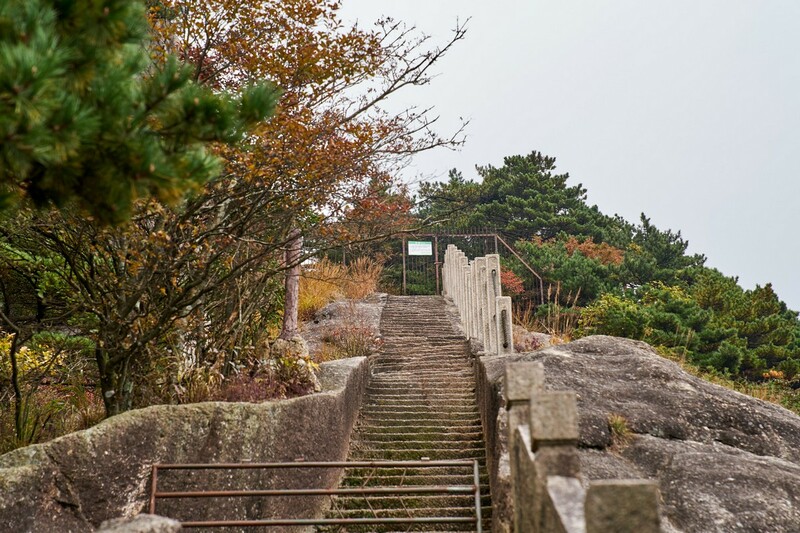 However, they don’t clear the paths, so walking them – especially the steep ones: bad idea. So bad, they close off many of the locations (including Lotus, Tiandu and Xihai) for December – March. Thus, alas, no chance of spending Christmas or seeing in the New Year here. Shame! 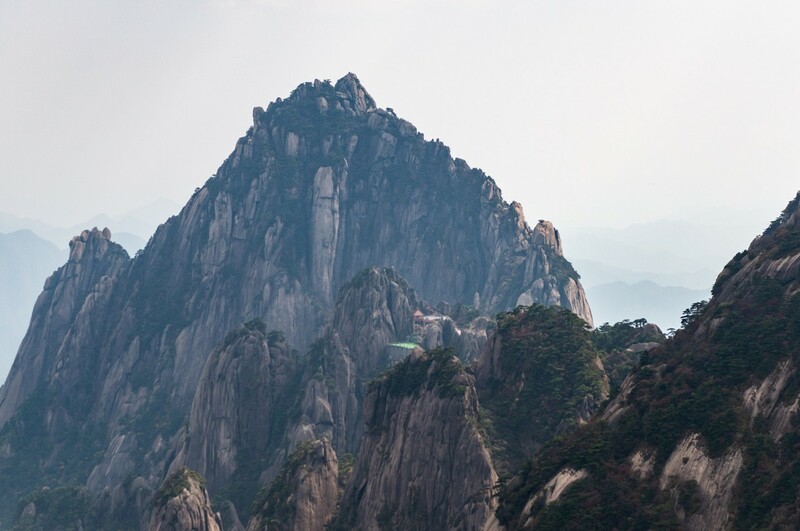 All the photos from Huangshan are, at least for now, here.